« The Unfinished Work of Elizabeth D.
WHY A PERFECT READ: If you harbor a pre-conceived notion that a self-published book is a 2nd class citizen, then you should check out this movie-like, very entertaining novel. 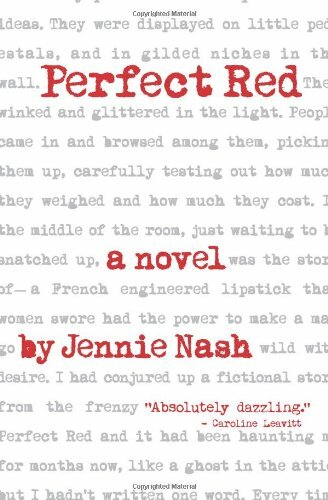 Perfect Red manages to be both light-hearted charming and seriously smart, a romance filled with drama, simple and complex, sweet idealism and harsh realities – an endearing story about passion and the consequences of pursuing one’s dreams. The time is 1952. The place is Manhattan’s powerful and thriving publishing world, when the country is dreamily experiencing a wave of consumerism. Yet the political backdrop is the McCarthy era, when Hollywood celebrities and ordinary citizens are being accused of being communists, having to testify before the House Un-American Activities Committee. Refreshing told in the young and bold female voice of Lucy Lawrence, who deftly manages to act innocently and maturely. She’s delightful, willing to endure great personal risks to pursue her passion of becoming a writer. She does not fit the stereotype of a 90 wpm typist, but that’s how we meet her, working in the typing pool of a major publishing company. She’s awfully bright, a marvelous reader and frequenter of the Inkwell bookshop. She’s got literary talent and an idea for a perfect novel about a chemist whose magic and passion has created the most perfect color red lipstick. The novel haunts her. She undertakes a number of steps to bring it to life, feel-good steps and dangerous ones. Jennie Nash’s prose is clever and evocative. My image of Lucy is a blonde version of Audrey Hepburn elegantly clad in white kid gloves, bright-eyed and naïve, yet possessed with an obsession to understand the real meaning of real passion. The language is so clean and good you can picture Lucy climbing the stairs to her room at the Barbizon hotel, sipping Coca Cola at the Horn & Hardart with her bookstore confidant Jeffrey, typing away on her turquoise Royal typewriter, infatuated with a famous writer. Don’t be fooled into thinking this is only a romantic comedy or that it is a shallow tale about wearing the right shade of lipstick. There’s much more, cleverly here. If you visit Jennie Nash’s website, you’ll see she’s no stranger to the publishing world. She worked at Random House and her first three novels (she’s also written two memoirs) were published by mainstream publishers. I kept wondering why she chose the self-publishing route for her fourth novel. You’ll find the answer on her website. 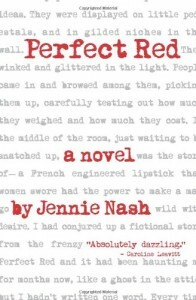 Interestingly, Perfect Red is being self-published in the US, and also being published in 2013 in Italy by Rizzoli. There’s an experimental spirit and freshness about this novel, including the fact that Nash provides the reader with several deleted scenes, something you see on DVDs and hear authors explain they’ve done but aren’t privy to see. Nash invites you to come along on the ride with this novel. The advanced copy of Perfect Red I received was wrapped with a bright-red ribbon, accompanied by sharp marketing materials that matched the prose. I explained I would have to “love” the novel to blog about it. You can tell that happened, so much so I ordered two of Nash’s earlier novels, The Only True Genius in the Family (2009, Penguin/Berkeley Publishing and The Threadbare Heart (2010, Penguin/Berkeley Publishing).